Mountain Cabin with Loft and Wrap Around Porch !!! Surrounded by woods, nestled among the mountains, this cabin is the perfect get-away from it all. Relax and rock on the covered porches and enjoy the sounds of the small rippling creek bordering the property. Very easy access for motorcycles. Located minutes from the tail of the dragon! This fully-equipped cabin sleeps six comfortably, 2 bedrooms with queen beds, loft with extra thick full size futon, two full baths, two covered porches and an open deck surround the cabin. Large windows throughout the cabin for great views of the mountains. This family oriented cabin provides hours of exploring for the kids-a small creek to play in - a yard to have a family game of kickball and catching fireflies at sunset. We are within minutes of Fontana Lake - there is a public boat ramp for a day of boating and fishing. Plan a picnic at the Fontana Dam and enjoy the breathtaking views or spend the day visiting the many nearby attractions - the Great Smokey Mountain Railway, Santa Land, Gold Mines, Cherokee village with its many shops or if you are feeling lucky visit Harrah's Casino. For the outdoorsman there are many nearby activities, hike the Appalachian Trail, whitewater rafting at NOC and the Ocoee Rivers and for the experienced rafter the Class IV Cheoah River, tubing at Deep Creek Park in Bryson City. Challenge the curves on the world famous Tail of the Dragon at Deal's Gap roadway, mountain biking on the trails of Tsali or nearby horseback riding at Fontana Stables. If you are into nature a must see is the Joyce Kilmer Memorial Forest and a day ride exploring the Cherohala Skyway. We are within a 45 minute ride to the Smokey Mountain National Park where a scenic ride through the park takes you to the city of Gatlinburg, Tn. For more information on these activities, check the Graham County, NC. Website. Scroll down to see additional pictures of cabin. We currently live in Stuart, Fl. My wife and I both work for the school system and try to spend as much time as possible in the mountains. This area is absolutely beautiful! Just driving to an activity is part of the vacation, scenic routes everywhere. You will love the cabin, very comfortable with plenty of room for everyone. You can spend the morning just sitting on the large porches enjoying the view! Small Creek - Kids Bring Your Water Shoes Please note the pond is not on our property and is not part of the vacation rental. The cabin is beautiful! Great place to relax and have some quiet time. The cabin was very nice and quiet. All essentials were provided. It felt like my home away from home. WiFi is provided at the cabin but don’t expect to have any cell service in the area. Very remote and private. Great place to bring the family. We really enjoyed our stay. I would definitely recommend this cabin if you’re looking for a quiet place to unplug, relax, and take in the mountain atmosphere. Thank you for your kind review! We are glad you enjoyed your stay! 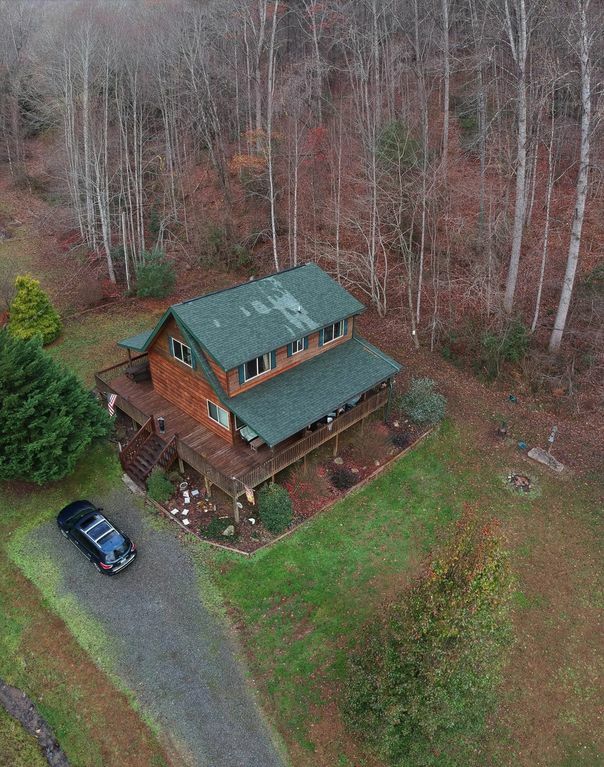 While it may seem remote, it is an easy access to the cabin and only eight miles to town and 20 miles to Bryson city! Hopefully some day we will be able to access cell phone service! That is why we still have the land line! Thank you for your business! Loved the cabin. The cabin was everything that it was represented to be. My grandkids were able to run around the yard and at dusk catch fireflies. Very peaceful. Thank you for your review. We are glad you enjoyed your stay! Making memories with your grandkids! Very nice roomy cabin in a beautiful setting with easy access. Nice to wake up early, sit on the porch and enjoy the peace. Put us 10 minutes from our whitewater raft adventure and about 20 minutes from quaint Bryson City. Would definitely recommend for couples or a family. Owner was very nice easy to reach by telephone. One small complaint- we enjoy cooking in and the pots and pans could use an update. Thank you Jon for your review . We are glad you enjoyed your stay..the area is really quite beautiful! We will take your advice on the pans too! Thanks again! ps...have bought new pans for the cabin! Thank you...we are glad you enjoyed your stay and look forward to next year! It was a wonderful cabin and a great area. The owners were great and responded to our messages quick, thank you! The cabin has everything you need, and it is in a nice and quiet area. There is a creek by it and just being on the porch was so relaxing! Thank you for your kind review. We are glad you enjoyed your stay. We love sitting on the porch, watching the birds and listening to the stream too! My family and I could not have asked for a better "mountain get away". We absolutely loved the cabin. It feels so homey. The kids loved the fire pit, and the weather was perfect for it. Everything was perfect from the inside to the wrap around porch. Our hosts maintained communication before the trip, they also gave great suggestions as far as activities around the area. Thank you ten fold to Karen and Frank for allowing us to stay in your beautiful cabin. We are glad you enjoyed your stay... best part of a vacation is making memories ! Thank you ! Please note our property ends right before the pond. This is not part of our rental. Check out time 10:00 am and check in time 4:00 pm. Please note that this is a rural area and garbage must be taken to the dump which is located off hwy 28 on the left hand side about two miles...there is a yellow intersection sign right before. Garbage bags are included with the rental. If you cannot take garbage, we can make arrangements for a $25.00 fee. Extra guest over six people, is an additional $20 per night. Thank you.